A tray can be used for much more than just serving. 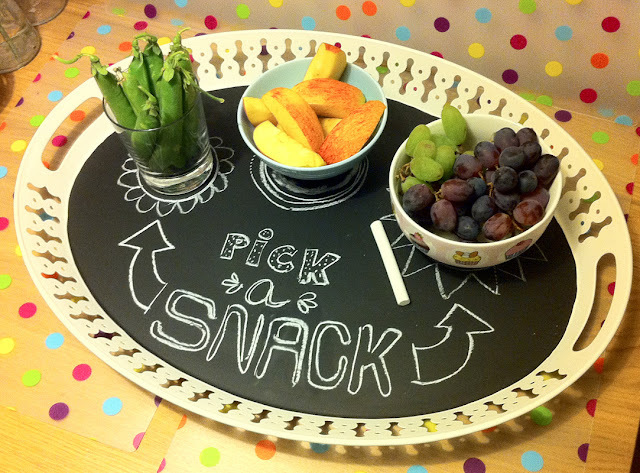 Painted with some chalkboard paint, use it to create an interactive party station or to just add some fun to your table decor. I was just in Jo-Ann's today and they had chalkboard paint in so many colors–even purple. What a cute idea to embellish the bowls with illustrations. Use this idea to create a topping station: ice cream, tacos for the soon-to-be-here Cinco de Mayo, pizza party, and more! Find the full post at Lea's Lirumlarum. This is such a cute idea. I really like this.